First and foremost, CONGRATS to the USWNT on their qualification for next summer’s World Cup!!! Are you coming with us? After a disappointing 4-2 defeat to Colombia on Thursday, the USMNT heads to Hartford to face Peru in their 2nd and final friendly before heading back to their respective clubs. The boys definitely had their moments against a tough Colombian team that included James Rodriguez, Carlos Bacca, and Radamel Falcao. Having conceded early in the match, the USMNT fought their way back and even lead 2-1 through fantastic goals by Kellyn Acosta and Bobby Wood into the 2nd half. Eventually we succumbed to a 4-2 defeat after the Colombians 2nd half onslaught. Experience gained, on to the next. The boys head to Connecticut to face a Peruvian team fresh off a World Cup appearance in which they will feel discouraged about not getting out of the group. Having finished in 4th place in the 2015 Copa America, Peru had high hopes for Russia. Zack Steffen returns Columbus after Thursday’s match. Think he’s done enough to cement himself as #1? Dave Sarachan has stated that Guzan will be Tuesday’s starter. Brooks & Miazga seem to be the #1 USMNT pairing but have looked shaky at times. As has Antonee Robinson, who struggled on the flank the last few matches. Kellen Acosta looked solid and had a tidy finish in front of the AO section on Thursday. Michael Bradley looked like Michael Bradley. Kenny Saief struggled. Tim Weah had a fantastic run and assist to Bobby Wood to give the USMNT the lead early in the 2nd half. Wood has maintained his goalscoring form – will he keep the start? 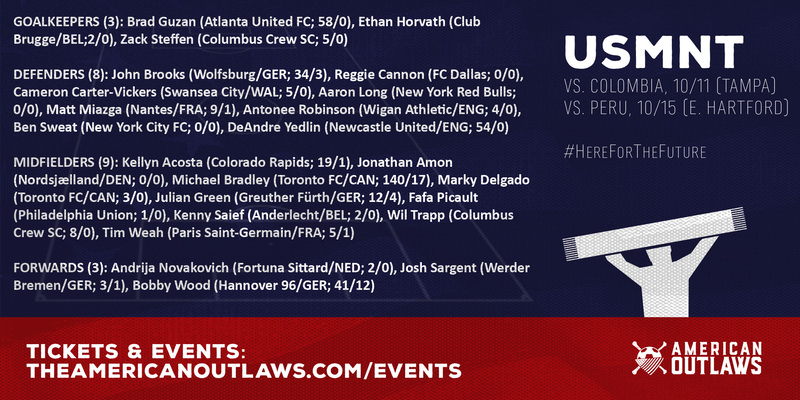 Or will Josh Sargent and/or Andrija Novakovich get the nod? Only Sarachan knows. These games for the USMNT have been entertaining if nothing else. Giving these young kids minutes is as important as ever with the looming Gold Cup followed by WCQ quickly thereafter. Get to your watch parties, get to the Rent. We need you.